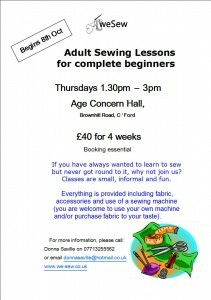 New Adult Sewing Class announced for Sept 2015! Thanks for your question received via my website. Yes, I am still running adult classes. I run a Wednesday evening workshop and a Thursday afternoon class. Yyou are very welcome to bring your own machine. Ideal way to familiarise yourself with it. The Thursday afternoon one is the less formal and easier for me to spend time helping you but I understand that day times are not great for everyone… I’m having problems attaching the flyers so if you email me directly on donnasaville@hotmail.co.uk I can forward you more details. If you would like more information or to book, please get in contact.